President Moon Jae-in proposed connecting South Korea with North Korea with a vast railway network in a move towards peace and prosperity after decades of conflict. 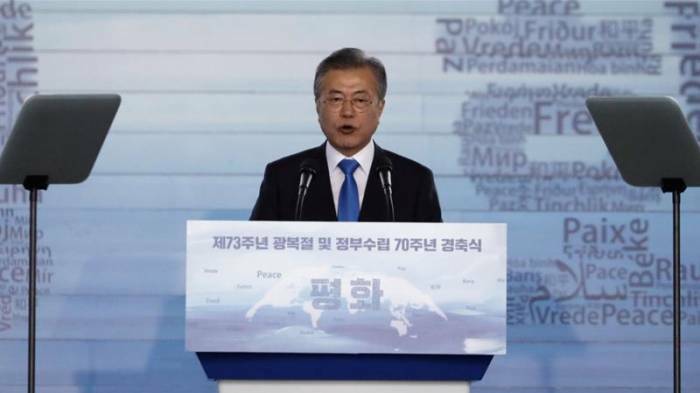 Describing what he envisioned as a "railroad community", the transport system would include several other countries including China, Mongolia, Russia and Japan, Moon said on Wednesday. "This community will lead to an energy bloc and economic bloc in Northeast Asia by expanding our economic area to the northern continent and becoming the foundation of co-existence and prosperity," he said according to Yonhap news agency. Moon modelled his plan after the European Union, saying that bloc originally started as an organisation for coal and steel, but eventually grew into something larger. The plan was unveiled during a speech marking the Korean Peninsula's independence from Japanese colonial rule 73-years ago on Wednesday. Officially North and South Korea are still at war having signed only an armistice in 1953 at the end of the Korean War. "Even though a political unification may be a long way from here, establishing peace between the South and the North and freely visiting each other and forming a joint economic community is true liberation to us," Moon said. Moon, who was elected to office in 2017, has been an advocate of closer relations with North Korea in an attempt to bring peace to the peninsula. Earlier this year, he met twice with North Korean leader Kim Jong-un in historic meetings during which the two countries pledged to sign a peace deal. At their next summit in September in Pyongyang, the two leaders will "take an audacious step to proceed towards the declaration of an end to the Korean War and the signing of a peace treaty, as well as the complete denuclearisation of the Korean Peninsula", Moon added.